Former National Security Council director Yaakov Amidror says Israel needs to be prepared to assist Jordan in fighting off ISIS. Speaking Sunday, former National Security Council director Yaakov Amidror said that if Jordan requested Israeli assistance in preventing its border with Iraq from being overrun by forces belong to to ISIS, the Islamic State of Iraq and the Levant, then Israel would have little choice but to help. “It's not just in Jordan's interest, but in Israel's as well to work together to solve this problem," he said. 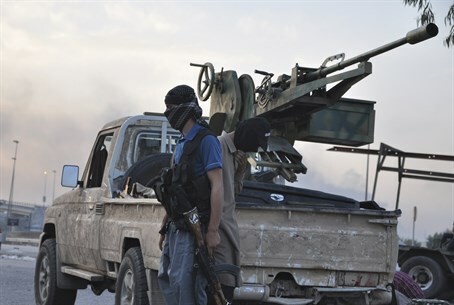 As the Sunni Islamist forces of ISIS have overrun Iraq, edging ever closer to that country's border with Jordan, Amman has expressed nervousness that it could be the group's next target. Some ISIS sources have already made unconfirmed claims to have seized a Jordanian town, although those reports appear to be false. Jordan on Friday deployed massive army forces on its Iraqi border, including tanks, army vehicles, missile launchers and soldiers, reported Yedioth Aharonoth, citing the Arab news source Asharq Al-Aswat. In the Arabic report, Jordanian sources were quoted as claiming that the Iraqi army still controls the area just over the Jordanian border, but that they have already lost control over adjacent areas. A senior Jordanian captain told the paper the army is at maximum preparedness so as to be able to get involved at a moment's notice. Jordan has good reason to worry; ISIS Islamists have publicly called for Jordanian King Abdullah's execution, declaring him a traitor to Islam who has joined forces with the West. ISIS threatened to "slaughter" the "tyrant" Abdullah in a recent video, which was uploaded to YouTube. The video features a Jordanian citizen and member of the Islamist group, who is seen tearing up his passport and throwing it in a fire while vowing to launch a suicide attack inside Jordan. Earlier this month, former Israeli intelligence expert Jacques Neriah suggested in a CNN interview that Israel must prepare itself for the eventuality that the battle could reach the shores of Tel Aviv - despite the fact that the fighting rages more than 915 kilometers (595 miles) away. According to Neriah, the current crisis in the Middle East has made Israel relatively quiet, and could buy the IDF time to prepare. "Everyone is busy killing one another in the Arab world - it gives Israel a 'time out' to reorganize and to prepare itself for the long run," Neriah stated. "If Iraq falls in the hands of ISIS, then we will have a terrorist state - where terrorists will be trained, will be equipped, will be financed by an [entire] state and not by an organization which is [in] hiding." Meanwhile, a report in the Daily Beast claimed that Israeli and US officials have already confirmed that their countries would join the battle against ISIS should it attack Jordan, with whom Israel has a peace treaty. Thomas Sanderson, co-director for transnational threats at the Center for Strategic and International Studies, told the Daily Beast that in his estimation any ISIS attack on Jordan would be viewed in both Washington and Jerusalem as a threat to national security. "I think Israel and the United States would identify a substantial threat to Jordan as a threat to themselves and would offer all appropriate assets to the Jordanians," he said. Concerns in Israel over ISIS's rapid territorial gains in Syria and Iraq comes amid claims ISIS-linked terror cells have been involved in recent rocket fire against southern Israel. On Saturday it was revealed that two Gazan terrorists killed in an IAF precision strike for launching rockets against Israeli civilians were members of a jihadi group linked to ISIS.